Widespread Panic’s runs at Red Rocks Amphitheater in Morrison Colorado have moved into the pantheons of legendary. 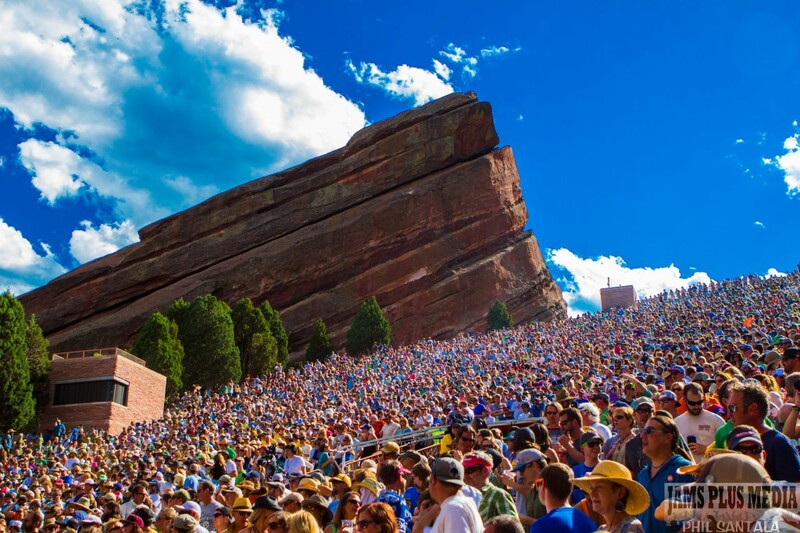 There is little doubt no other band has, or will ever have, such strong ties with this historic amphitheater. The southern jam band consistently sets records here. They currently hold the records for the most sold out shows, the most shows performed, and consistently shatter record concession sales. Given that the band originated well south of the Mason-Dixon line, these feats are even more impressive. 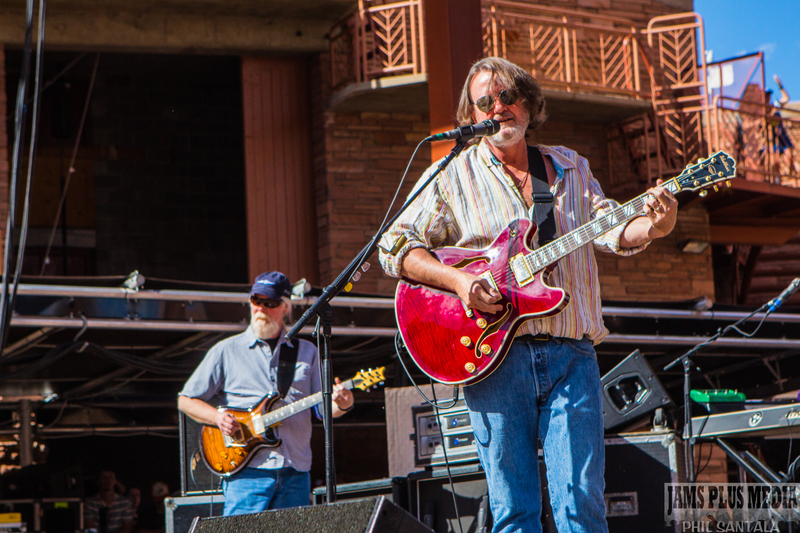 John Bell and company returned to Red Rocks this summer near the end of their abbreviated 20 show summer run. Panic had only a few shows left, one at the Las Vegas venue “The Joint” and festival stops at High Sierra, and The Gathering of the Vibes. The June run of shows brought the boys up along the coast with stops at the Red Hat Amphitheater, the Mann and others before swinging inland. Coming into Red Rocks they had even more to play for. Friday’s show would be their 50th at the historic venue. 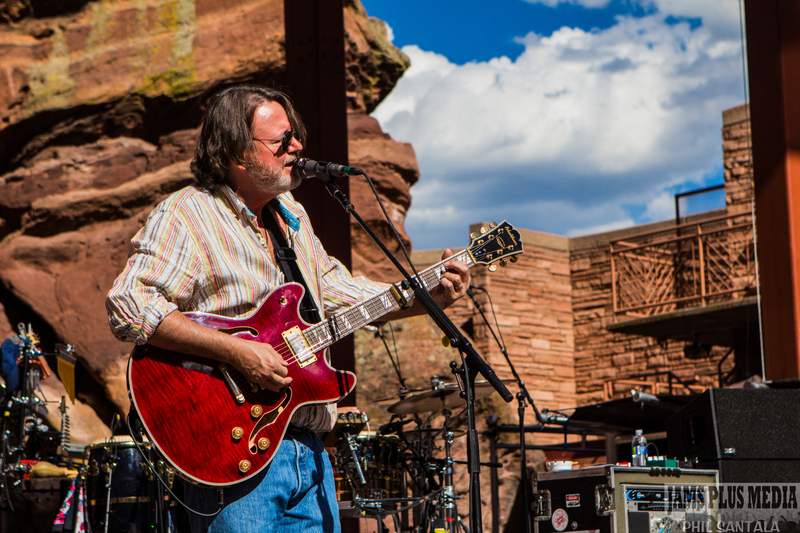 The Golden Anniversary of Widespread Panic at Red Rocks. 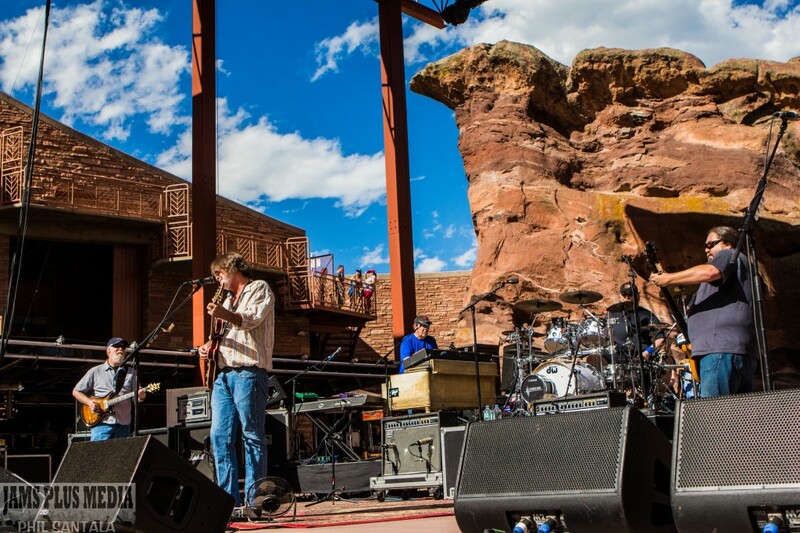 By all accounts Widespread Panic was coming into Colorado on fire, a fire that not even the rains of Red Rocks could squash. Rain is almost always part of the equation at Red Rocks. Last year torrential buckets of rain came down Friday night. Earlier this summer at the Artpark in Lewiston, NY the second set was cancelled for severe weather. Friday the clouds over Denver were grey and threatening and the rain kept pouring down. Fans hoped it wouldn’t rain all day, but showers intermittently hit the lots as fans rolled up from Denver. As the band took to the stage the rain let up and the sun came out, not to mention the rainbows. Oh the rainbows…while “we were getting dry.” Rainbows, both single and double, arched across the back of the stage as the band moved from “Tortured Artist” into “Send Your Mind.” The band clearly demonstrated the continuity of their sound during the latter. The pause and re-entry into the chorus at the end of the song was spot on. The years have been kind to John Bell, the howls just seem to get louder and the growls just get deeper. Panic’s first set would be sprinkled with weather predictions and storytelling, the highlight of which would be Van Morrison’s “And it Stoned Me.” The “Send your Mind”/“And it Stoned Me” Van Morrison 1-2 combo would be a trend repeated over the weekend. Covers were often grouped by artist and the formula works well. This direction established some well-flowing points throughout the weekend. The reappearance of “Bayou Lena” in the second set was unexpected. The band had sound checked the song twice prior to the show, but for most in attendance this was not well known. It’s appearance for the 1st time since 2008 was totally out of left field. But it was Panic’s 50th performance at Red Rocks and the setlist looked, in no particular order, like a quasi-retrospective event. Love it or hate it, the song has deep roots in Widespread history. It links where the band is now to where they came from and ties the two together. The closing notes of “Driving Song” and then going into “Bayou Lena” may have just been a fluke, or maybe it was a message… Songs like this are what Widespread Panic does best, by taking a story and then letting you write in your own meaning and parable. The first night’s encore featured the Talking Heads triple decker of “Papa Legba”, “Life During Wartime”, and “City of Dreams.” The placement of “Life During Wartime” as the middle song was brilliant. The crowd took off into a full blown dance party during the song, and everybody (and I do mean EVERYBODY) got up to shake it during that song. The “City of Dreams” closer was the icing on the cake. The crowd seemed ready to take a breather and call it quits when the band melodically pushed into the song. The slow cover gave everybody a chance to breath and share in a collective moment with those around them. 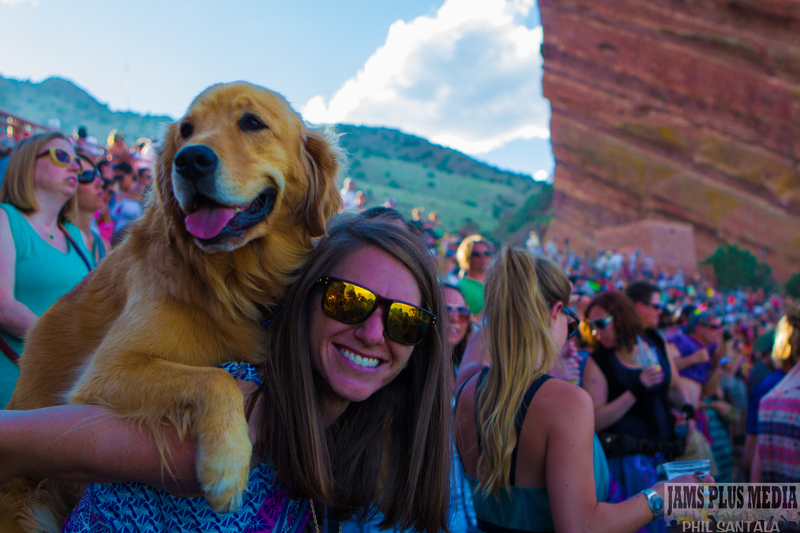 The rain let up, the sun had come out, and everyone was hot and dry for night two of Red Rocks. 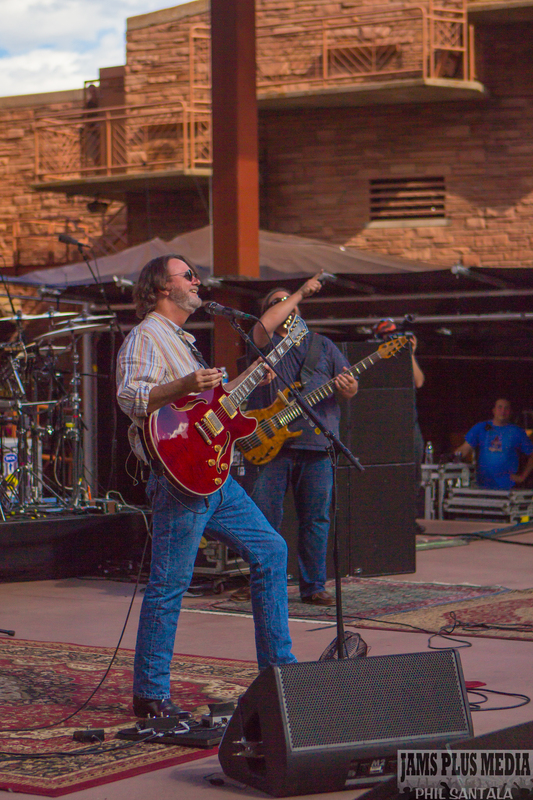 Widespread Panic returned to the stage ready to dish out more signature southern jams. Collected covers and classic Widespread was on tap for the evening. The intro to “Shut Up and Drive” sounded vaguely like “Rock” which would make its appearance in the second set. Coming out of “Greata” it seemed like drums had come early to the first set, but it was only a low down dirty “Fishwater.” Sunny Ortiz’s drums called fans in like lambs to the slaughter. JoJo Hermann’s keyboard styling was spot on during this, as it was all weekend. He was clean and crisp throughout the run, resembling Dr. John meets a New York city kid. Both the solos and his subtle undertones could not be denied as a vital part of the run. Jimmy Herring stepped in with just the right timing and finesse for this signature Panic song. The Vic Chesnutt cover grouping of “Aunt Avis”, “Degenerate”, and “Protein Drink>Sewing Machine” to crescendo the end of the first set was done brilliantly. “Aunt Avis” and “Degenerate” both are slow boil songs that build and lumber along, driven by a low end slow rhythm and then carried by John Bell’s vocals. “Protein Drink> Sewing Machine” leans more heavily on Jimmy Herring’s screaming guitar and Dave Schools’ heavy bass bombs. Second set’s outlier song coming out of “Barstools” was rookie cover “Honky Red” by Murray McLauchlan. This song has recently been placed into the lineup, having first appeared in the spring of this year. Up at the top of Red Rocks the lyrics of the this ballad seemed to wander a bit in precision and volume. JB’s usually crisp vocals seemed to become more twisted in the wind. It could have been the thermals, or a sound mix issue. Still the outcome was that one had to strain more to pick out the vocals, which are prolific. The result, or perhaps the cause of this, was that JB seemed hesitant on this tune. It was a bit disappointing, but also maybe the consequence of the song being so new. The Neil Young cover “Don’t be Denied” was received with cheers, goosebumps, and some tears. This song has a long and storied history with the band, and it’s fans. 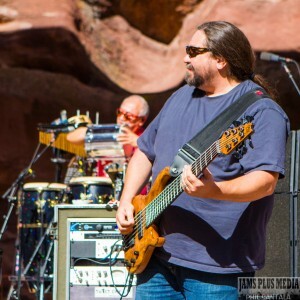 Lines in it seem to mirror the story of Widespread Panic’s growth. For fans of an old enough vintage this song evokes memories not just of a lineage that tells that story, but of the memories of those days and people long past. Again, it’s a song that many in the audience have put their own personal stamp onto. The goosebumps felt now are just as real as those felt back at Oak Mountain in 2002 when the song told the story, and still the possibilities, of the band in it’s original inception for the final time. The “Chainsaw City” closer found the lower rows of Red Rocks open as many scrambled for the exits to beat the traffic going home. For those with enough time and patience the result was a long, drawn out Chainsaw with lots of room to boogie. 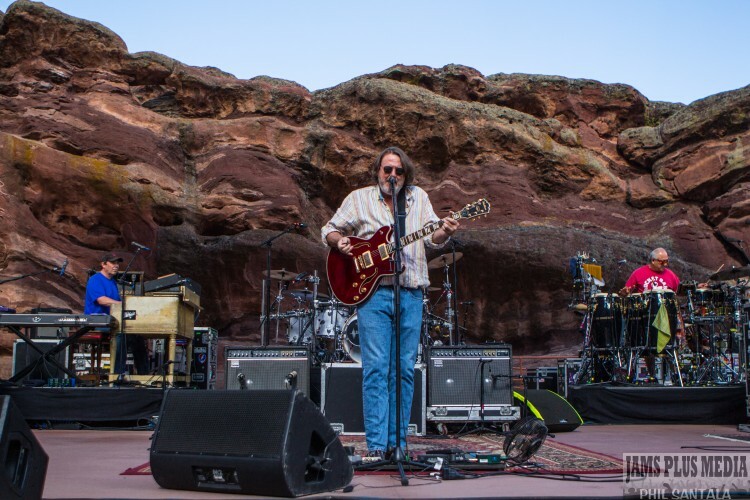 A rare treat at Red Rocks. The third night could be just as much about the music and the songs played, as the feeling in the venue. John Bell would bookend the show with his some of his classic JB-isms. Sometimes that man just knows exactly what to say. JB is one part Southern Redneck, one part Southern Gentleman, and two parts Shaman. Having now played 51 shows here, and selling out their 45th show in a row the band just seemed more than comfortable. That’s a bold statement considering the stage at Red Rocks for the early show is more akin to a crucible or kiln than a concert venue. As the band took to the stage JB squinted out at the crowd and scratched out for all in his signature growl/drawl “Welcome children…if we can use our collective psychic ability to bring a cloud every now and then…that’ll be cool too.” No sooner had he spoken, then the stage darkened and Dave pointed skyward as the crowd erupted into cheers. Ask and you shall receive, JB. The band continued the pairing of old and new. “Better Off” and “Genesis” are both timeless songs, even if one is a cover. “Better Off” was inexplicably shelved by the band for 5 years at one point despite it’s heavy rotation in the 90’s. The song sums up so much of Panic, and Red Rocks: rock and roll, with time and space warped into them. The whole first set could be viewed through that same lens, a set dedicated to the intersections of space and time. “It Ain’t No Use” continues this trend. Decisions, confusion, time and space thrash about as JB spits out “Don’t wanna go, don’t wanna stay, don’t wanna go, don’t know what I want to do now…” But despite all the weirdness, the crazy, the trials and tribulations we still keep coming back around. For years on end fans circle around. Things change, the “old neighborhood just ain’t the same” still fans return, like “Ophelia.” The Band’s second song of the grouping “The Shape I’m In” leads back to the theme of finding one’s spot in time. The set closer, and third song by The Band “Chest Fever” brought the intersection of time and space to a close. Hot and heavy the Panic thundered and built the song before closing it out. The Bloodkin triple song opener for the second set had it’s commonalities as well, but one would expect that, given the band’s storied past. Public and forthright about their personal struggles “Can’t Get High” ,“Quarter Tank of Gasoline”, and “True to my Nature” rolled everyone into the first set. “Can’t Get High” was clearly a winner in the crowds eyes. The toss up is that it was the fastest tempo of all three songs, and most surely the best known as well. Buried in the set was “Time Fades Away.” This Neil Young cover is moving into circulation and has a beat that fits well with Panic’s styling. It provides Jimmy and JoJo ample room to move in with a blistering solos, but the song still maintains its direction and pacing. The noodles in this case do not distract from the sauce, as it were. The encore of the third night was a fitting toast to the run. The slow “May Your Glass be Filled” was perfectly juxtapositioned against the Jerry Joseph cover “Climb To Safety.” JB’s slow melodic voice pulled the band along, and the occasional low reverberations of the guitars off the rocks was perfect as the afternoon breeze set in. The breeze would be needed as “Climb to Safety” provided only the occasional respite to catch one’s breath. The only slow moments were when JB would build the crowd with the dirty rumblings of “you say love, has always scared you, like the thing under your bed”. 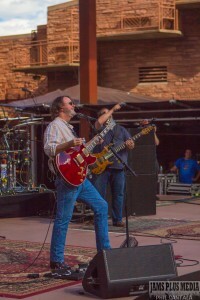 JB soothed the crowd along, after which he and the band would take flight again into the chorus. Before the encore, JB would slap the other end of the previously mentioned bookend with another signature JB-ism: “Thank you, good people, for giving us a home away from home for all these years…”. 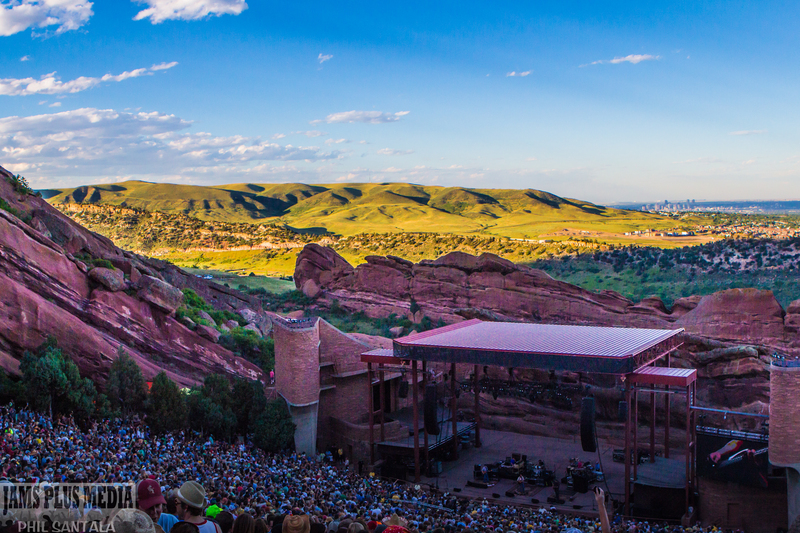 Colorado and Red Rocks alike stand testament to that. For years the band played two runs in this state during the summer. For 52 shows spanning three decades John Bell, Sunny Ortiz, Dave Schools, Todd Nance and JoJo Hermann have walked up that ramp and onto that stage. For over 30 years “the boys” have been greeted by cheers, as they were yet again. Some in the audience have been there for every moment. Many in the audience have not been alive long enough to have done so. Space and time have intersected over those dusty parking lots and those wooden benches over and over again. Some nights it’s hard to tell the years apart. Old friends and memories crawl out of the amps and woodwork. They spill down from Shiprock Crack, and whisper to you through the winds. Old ones seep in, and new ones take root. Whether it’s your first show or your 52nd the message in the end is the same…don’t let a single memory fade away. Listening on the stream now. Great article. Goosebumps. I love this band. I love my Widespread Family. I celebrated my 50th show Friday. I will never let another Red Rocks Run pass me by. Happy anniversary. See you next year. Good article for panic good people and those getting interested. One of the best reviews I have read in a long time! Good stuff! Thanks Victor and Brandon for your remarks!! My wife and I have been seeing Panic off and on (some hiatus from having two children) for the last decade or more but what a weekend and not to mention what a weekend for our first time at RR. What an incredible place!